Games are all about the experiences that they offer. Though we may learn, socialize or otherwise improve ourselves through games, most players play because they want to have a wide variety of experiences. Players with disabilities are no different. To get players really playing your game, it is not enough to simply give players access to the controls of your games so that they can steer a car or shoot an arrow, but instead to give them the experience of being Formula 1 driver or an adventurer in a fantasy world. 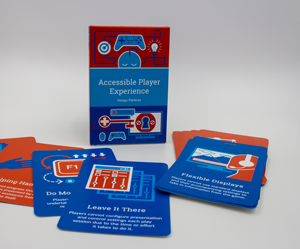 With APX, we are shifting the aim of accessible design to be about making these experiences possible for players with disabilities through a variety of different options. In order to help designers like you create amazing APX, we have broken down the accessible design into three layers represented as the APX Triangle. Before anyone can play your game they need access to the game. This means they need to be able to perceive what is going on in the game and to take control of actions in the game. In other words, players need to be able to sense (see/hear/feel) the output of the game and to provide input to the game (click/tilt/speak). 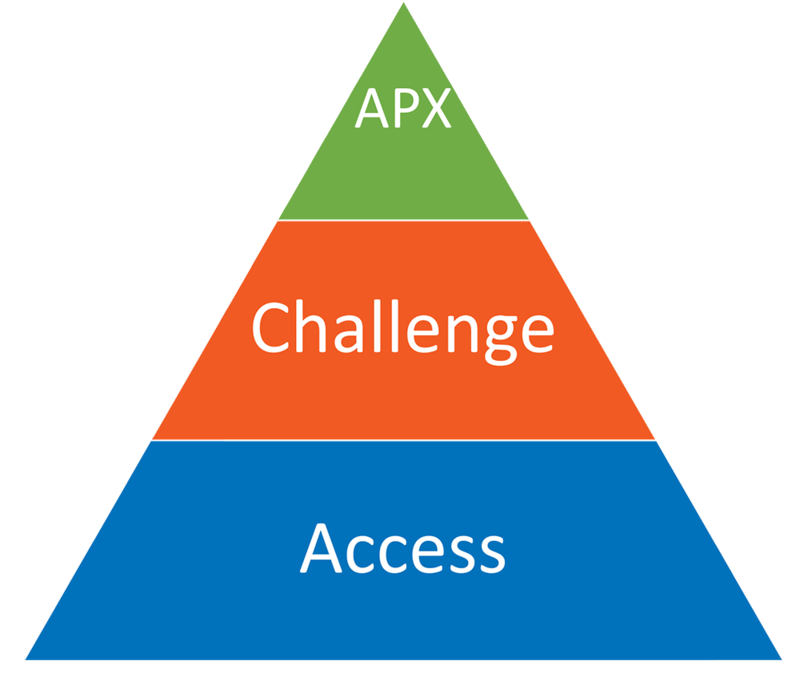 Ensuring this access, represented as the bottom layer of the APX triangle, is the first step to providing an APX, without which, many players with disabilities are excluded from your game. Our Access Patterns address the problems in this layer. Once a player has access, they need to be able to play the game itself through interacting with what we call in general terms the game world, whether this is stacking falling blocks or exploring a distant mountain range. But games are challenging and for some players, those challenges are overwhelming even after they have the perfect access settings. The enemy is too fast or the puzzle is too hard, or the content is too intense. If there is no way to manage the challenge, then players will have to stop playing your game even after all the work you put in ensuring they had access. Players need to be able to adapt the game in a variety of ways to make it so challenges within the game are not unreasonably hard or impossible to overcome. Providing for this diversity in levels of challenge is the second layer of the APX Triangle, and our Challenge Patterns help illustrate different ways designers have adapted challenge for accessibility. Only when a player has access and can have a chance of overcoming the challenges in the game can they have the player experience you want them to have. And when you have done, that you have created an Accessible Player Experience. Providing access to your games and adapting the challenge changes your game. But we are not saying you should limit or water down the experience your game offers. If you want your game to offer the edge-of-the-seat tension of stalking a wild animal through the forest then that’s the player experience you should be aiming for. What APX offers is a way to think about whether you could provide that experience to players with different types of disabilities. In some cases, you may not be able to make every experience accessible to everyone. But then again, not every player wants to have the experience you are offering. APX is about helping you think about what you can do for players with disabilities while still producing the game you really want to make. Before a player with disabilities can even kill their first monster, race their own car, or take their first point, they need to be able to access the world you created. Access design patterns help you do just that. These 12 patterns give you the tools to ensure that a player can tune the experience to meet their unique needs. Now that a player with disabilities can access your content, it is time to ensure they can consume the story you want to tell. Some may say, “but these make my game easy” and that is simply not true. They make your game enjoyable for all players. As you will see, these are options, and as such, let your game challenge the player, no matter their ability.